Portable Reverse Osmosis System by Crystal Quest is a 3-cartridge, 10 stage filtration system that can be used on the counter. The whole system uses 3 cartridges and employs layers of Granulated Activated Carbon(GAC, Coconut Shell) along the pre and post RO process ensuring the purest water output. 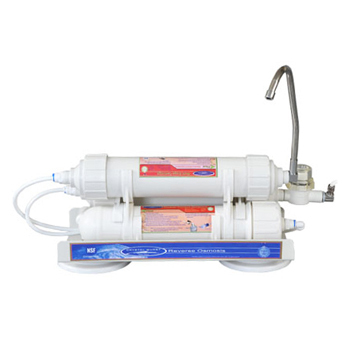 The reverse osmosis membrane removes and filters particles as small as 1/1000 of a micron as well as most inorganic chemicals(such as salts, metals, minerals), most microorganisms including cryptosporidium and giardia, and most inorganic contaminants. Eagle Redox Alloy media on the post process oxidizes chlorine and removes heavy metals such as lead, mercury, copper, nickel, chromium, cadmium, aluminum, and other dissolved metals by electrochemical process. Overall resulting to the cleanest water you can have. The best part is - this water filter system is portable! Whether on vacation or on a business trip, this unit will let you have access to the safest and highest quality drinking water within reach. High quality drinking water on the go. All the best filtration combination - GAC, KDF, RO and multistage. 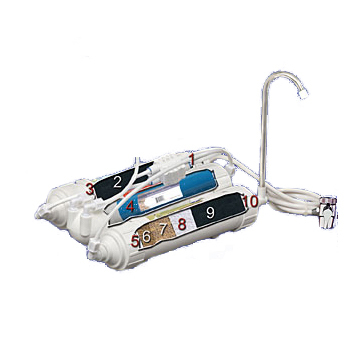 Can be used in trailers, RVs and boats - just hook it up to a sink faucet! Good water pressure, 40 PSI or higher, is strongly recommended. 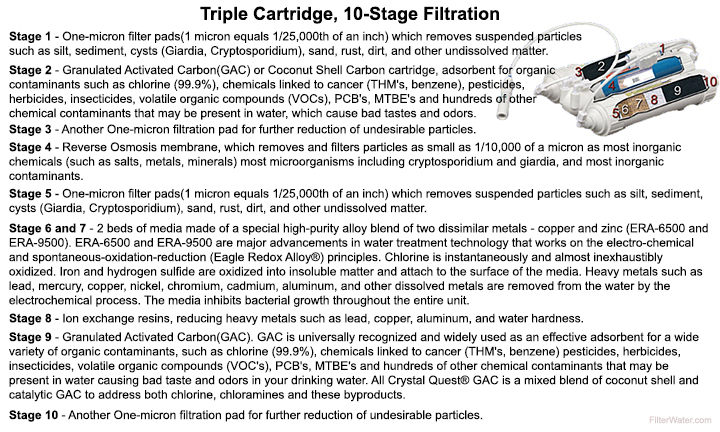 - Optional add-on filter cartridge: fluoride, nitrates, arsenic and other water contaminants. - System comes with a high capacity low pressure membrane that can produce more than 50 GPD of water (but will realistically only produce up to 50 because of the countertop system limitations). 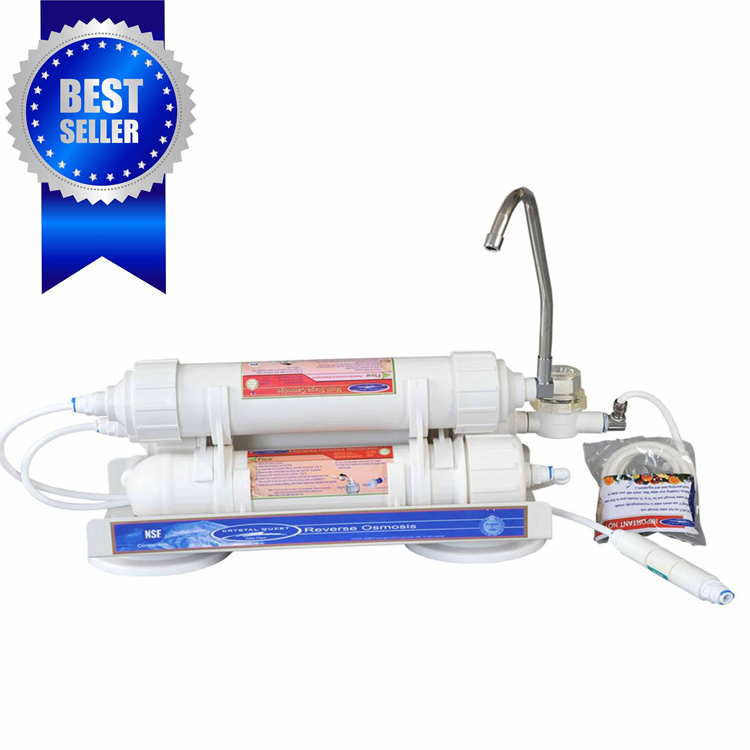 Portable Reverse Osmosis system depends on your water pressure to produce enough quantity of drinking water. Amount of produced filtered water is pressure-dependent, 50 psi and up is recommended. If pressure is below 40 psi, we suggest looking for a different system. - All hardware is included.